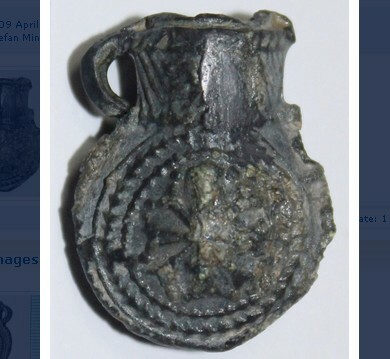 The Regional Museum of History in the Bulgarian Black Sea city of Burgas has postponed the exhibition of the recently found lead tube reliquary containing ashes from the grave of John the Apostle in Ephesus because it has failed to procure a magnifying glass box. The unique lead tube reliquary, which has been found in an Early Christian basilica which in the ancient and medieval port of Burgos (Poros) on Cape Foros, in one of the quarters of today’s city of Burgas, was supposed to be put on display as of May 18, 2015. However, the lead reliquary containing powder from the grave of John the Apostle (known in Bulgarian (Eastern) Orthodox tradition as St. John the Theologian) is only 2.2 cm (less than an inch) long, and its diameter measures 1.7 cm, and cannot be displayed without a special box made of magnifying glass. “The tube itself is very small, and we are working to get it into a box made of magnifying glass so that it can be viewed by our visitors,” says Milen Nikolov, Director of the Burgas Museum of Archaeology (also known as the Burgas Regional Museum of History), as cited by Radio Focus Burgas and the Focus news agency. “This is a jewel that warrants special means of exhibition,” he adds, explaining also that the magnifying glass box is expensive and hard to produce. The unique discovery of the lead tube reliquary was made during the excavations of the Fortress of Burgos (Poros) in 2014 but was only made public at the end of March 2015. In spite of its small size, the reliquary is richly decorated with the image of an equal arms Byzantine cross within two medallions on one side, and the images of two overlapping crosses with drop-shaped ends of their arms, also within two medallions on the other side. Two more crosses can be seen on the neck of the reliquary tube. The unique lead reliquary found at the Fortress of Burgos (Poros) on Cape Foros near Bulgaria’s Burgas is dated back to the 6th century AD. The Burgas Museum says that before its discovery there had been a total of 43 lead reliquaries from Early Christian pilgrimage centers known in the world. These include 20 which were found in the St. John the Baptist Basilica in Monza, Italy (the Monza Cathedral), as a a gift from Lombard Queen Theodelinda (c. 570-628) made at the beginning of the 6th century; another 16 lead reliquaries found in a grave in the Bobbio Abbey (a monastery founded by Irish Saint Columbanus in 614 AD) in the Italian town of Bobbio, close to Milan; one lead tube reliquary discovered in the Sant Pere de Casserres Abbey, a Benedictine monastery in the town of Les Masies de Roda, Osona comarca, Catalonia, Spain; three others are kept in Germany and four in the USA. However, all of those reliquaries were produced in Jerusalem and have depictions of Gospel scenes; the only thing they have in common with the Burgas reliquary is that they are made of lead but the Burgas find is said to be fundamentally different. There is also a group of clay tube reliquaries from the ancient city of Ephesus in Anatolia which were bought at the end of the 19th century for the Louvre Museum in Paris. These clay tubes are connected with the cult for St. John the Theologian (John the Apostle), Jesus Christ’s favorite disciple. In Early Christian times, every year pilgrims would flock to the grave of St. John the Theologian in Ephesus on May 8, which is believed to be his birthday; they would place roses on his grave, and the next day the grave was found to be covered with powder that was believed to be capable of curing any diseases. It is this manna that was collected by the Early Christian pilgrims in tube reliquaries and taken to their home towns. That is why, the Burgas archaeologists are convinced that the lead tube reliquary they have found at the Burgos (Poros) Fortress on Cape Foros most likely belonged to a local pilgrim who brought it from a pilgrimage to the grave of John the Apostle in Ephesus. According to the Bulgarian archaeologists, until now it has been believed that only clay reliquaries were produced in Ephesus but the Burgos (Poros) find proves that this was not the case. 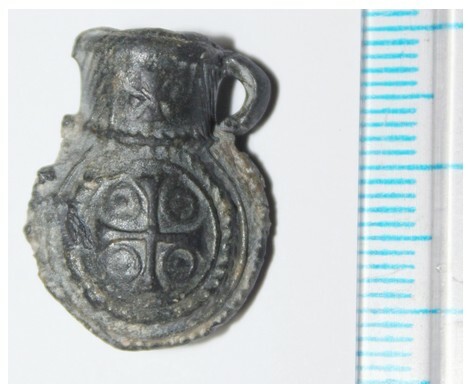 The discovery of the lead tube reliquary with ashes from the grave of John the Apostle in Ephesus near Burgas resembles another relic discovery from the same region, Bulgaria’s Southern Black Sea coast. Back in 2010 during excavations of an ancient monastery on the St. Ivan (St. John) Island in the Black Sea, off the coast of Bulgaria’s Sozopol, just to the north of Burgas (and the ancient and medieval port of Burgos (Poros) on Cape Foros), Bulgarian archaeologist Prof. Kazimir Popkonstantinov discovered a reliquary containing relics of St. John the Baptist. The relics of St. John the Baptist, which consist of small bone particles from a skull, jaw bone, arm bone, and tooth, have received lots of international interest in the years since then, and in February 2015 CNN reported that Oxford University scholars had confirmed the possibility of their authenticity by concluding that they belonged to a man who lived in the Middle East at the same time as Jesus Christ. The ancient and medieval fortress and port of Burgos (Poros) is located on the Cape of Foros in the Bulgarian Black Sea city of Burgas. It was first excavated in 2008 by archaeologists Milen Nikolov (currently Director of the Burgas Regional Museum of History), Dr. Tsonya Drazheva, and Konstantin Gospodinov, after access to its site was denied for decades because of the existence of a nearby military base which has been closed down in recent years. Part of its fortress wall was first discovered in 1989 during the construction of a cow farm. Even though there have been traces of ancient life, the fortress and port city of Burgos (Poros) on the Cape of Foros in Bulgaria’s Burgas is dated back to the Late Antiquity / Late Roman period, with the Bulgarian archaeologists uncovering a large number of buildings, artifacts, and pottery vessels dating back to the 4th-6th century AD. Their excavations have revealed a complex set of fortifications, including walls, ramparts, and towers, which were rebuilt and reorganized multiple times from the 4th until the middle of the 15th century, and were in use throughout this entire period by different states: the Roman Empire, the Byzantine Empire, the Bulgarian Empire, the Ottoman Empire. Some of the more interesting finds including a stone block with an Ancient Roman inscription in Greek mentioning the name of Roman Emperor Gordian III (r. 238-244 AD); a 2nd century AD inscription carved into stone stating that “burgi” (fortifications) were built on the border of the Roman colony of Deultum (located some 10 km inland from the Black Sea coast near today’s town of Debelt) – hence, possibly, the name Burgos; a basilica; the remains of a small monastery called “St. George” which is described in a 13th century Byzantine source; the 6th century lead tube reliquary containing ashes from the grave of John the Apostle in Ephesus, Anatolia. The Foros pennisula was marked on Italian and Catalan maps from the 13th-17th century as an old fortress and port under the name Poro (strait) or Poros, which means that the fortress defended the waterway entry point of the nearby Lake Mandra which flows out into the Black Sea. A stone inscription dating back to the 2nd century AD (presently exhibited in the Burgas Regional Museum of History) discovered on the site states that “burgi” (fortifications) were built on the border of Roman colony Deultum (located some 10 km inland from the Black Sea coast near today’s town of Debelt). Historians believe that there used to be a large fortified port along the waterway between Lake Mandra and the Black Sea which served and protected the Roman city of Deultum. The Roman road station called Pudizo marked in the 4th century Tabula Peutingeriana (the Peutinger Map showing cursus publicus, the road network in the Roman Empire, covering Europe, North Africa and parts of Asia) has been discovered in this same area. The area of the Burgos (Poros) fortress and the Cape of Foros is also famous for being the site of a major battle during the Second Bulgarian Empire (1185-1396 AD). The so called Battle of Skafida (named after the Skafida River and the Skafida Fortress, another medieval fortress located nearby) took place in 1304 AD when the forces of Bulgarian Tsar Theodore Svetoslav (r. 1300-1322 AD) defeated the army of Byzantine Emperor Michael IX Palaiologos (Palaeologus) (r. 1294-1320), after having reconquered earlier the nearby Black Sea cities of Rusocastro, Mesembria, Anchialos, Sozopolis and Agathopolis. The victory in the Battle of Skafida helped the Second Bulgarian Empire regain most of the region of Thrace from Byzantium bringing it a period of relative stability at the beginning of the 14th century, after feudal strife had put it in a state of permanent dynastic crisis at the end of the 13th century.